This week’s content is brought to you by Risun Udawatta. Bitcoin made splashes last year as its price rose meteorically from $964 at the beginning of 2017 to $19,476 by December 2017, a 1,921% appreciation. This rise led to Bitcoin and other cryptocurrencies becoming household names to retail and institutional investors as they jumped into the market to get a piece of the pie. As shown over this past year, however, Bitcoin has fallen significantly and currently trades at $4,015 (as of 11/26/2018). 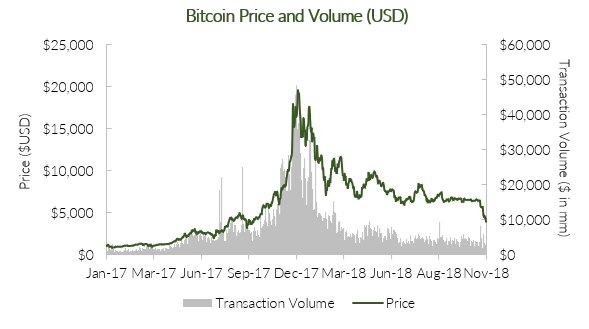 In addition, Bitcoin transaction volume has mirrored the rise and fall in Bitcoin’s price. Year-to-date, Bitcoin transaction volume is down 72%. The most recent drop has come in the wake of a “hard fork”, or split, in Bitcoin Cash, which was accompanied by a souring market among other cryptocurrencies as well. Bitcoin Cash, which is a clone of the original bitcoin, split into two different versions earlier this month after the coin’s developers and miners could not agree on the future direction for the cryptocurrency. As Bitcoin rose to prominence, many retail investors rushed into the market, asking how to buy Bitcoin and other burgeoning cryptocurrencies. Investors now have access to a variety of platforms on which to purchase several cryptocurrencies, including Kraken, Gemini, and Robinhood, among others. Recently, traditional financial services companies have joined the fray as well, including Fidelity and TD Ameritrade, who have both announced plans to include cryptocurrencies on their respective platforms. These marketplaces, in particular Kraken and Gemini, have steadily expanded their offerings to include other cryptocurrencies – notably, Ethereum, Bitcoin Cash, Litecoin, and USD Coin, among others. Largely, these other cryptocurrencies have followed the rise and fall of Bitcoin but have yet to challenge its market dominance. According to some analysts, Bitcoin is close to a “capitulation moment” when investors lose confidence and sell out of the asset. With Bitcoin dipping below $4,000 on Monday, any further drops in Bitcoin may reverberate across the crypto-market, causing investors to increasingly sell other cryptocurrencies as well. The effects of the cryptocurrency collapse are yet to be meaningfully felt upstream at VC funds and startups. There are even signs that there is continued investor appetite for this industry. Andreessen Horowitz announced in June 2018 that it launched a $300 million crypto fund. Additionally, multiple crypto startups have recently announced fund raises. Securitize, a compliance platform for issuing and managing digital securities, raised $12.75 million in a Series A round led by Blockchain Capital this week. CryptoKitties, a blockchain-based virtual collectables game company, raised $15 million in a round led by Venrock at the beginning of this month. Lastly, Adhara, a liquidity management and international payments platform based on tokenized money, raised $15 million from Consensys in October. Weekly Update #299: Can Uber Deliver Target Returns to the SoftBank Vision Fund’s Investors? Weekly Update #297: Lyft Is Finally Public—So What Happens Next? Weekly Update #291: The Funding Tap Is Running for Autonomous Vehicle Startups, but When Will the Technology Be Ready for Mass Public Rollout?